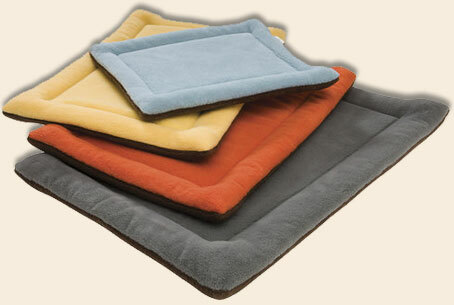 Cats can rest easy on our stylish, ultra durable, machine washable, and earth friendly Eco Nap® . These mats utilize our eco fabric, milled in the USA with 85% of the fabric comprised of IntelliLoft™ fibers - post consumer recycled plastic, better known as soda-pop bottles. Over 9 plastic bottles are diverted from landfills with every 19"x14" Eco Nap and more than 14 recycled bottles are used in every 24"x19" Eco Nap® ! Even better this bed is Certified Safe by third party testing! You and your cat can rest comfortably, knowing that every part of this bed has been rigorously tested for over 100 potentially harmful substances and found to be 100% Safe! So go ahead, give your kitty a comfortable place to rest and do your part to protect planet Earth. No compromises. Machine Washable. Made in Montana, USA. $24.95 - Extra Small - 19" x 14" x 2"
$29.95 - Small - 24" x 19" x 2"
$39.95 - Medium - 28" x 20" x 3"